Judith van de Mortel started as a lecturer for ‘Healthy plants in vital and sustainable soil’ at the HAS University of Applied Sciences in Venlo last year. This new lectureship focuses on the interaction between plants and the soil they grow in. The Regional Water Authorities of Limburg is now financially contributing to it with a budget totaling 150,000 euros over a period of four years. HAS University of Applied Sciences and The Regional Water Authorities of Limburg have officially signed a cooperation agreement for the lectureship this week. The focus of the lectureship mainly lies in the interaction between soil biology and the plant and using this interaction to make the soil more vital and sustainable. 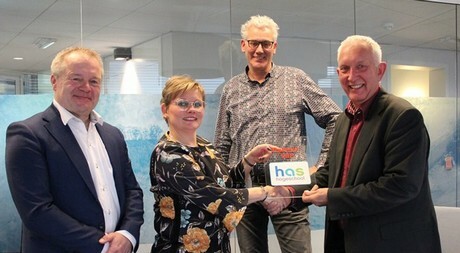 Besides The Regional Water Authorities of Limburg, HAS University of Applied Sciences, the Province of Northern- Brabant and the Agricultural and Horticultural Association of Limburg (AHAL) are also contributing financially. The Lectureship ‘Soil’ is the first lectureship stationed at the HAS-location in Venlo and will run till 2022. “The soil quality is an important theme in many of the current social discussions surrounding climate change”, state Michel Bouts and Har Franken, both of whom are members of the Executive Board of The Regional Water Authorities of Limburg. “The importance of a higher quality of soil for the water management is mainly for the improvement of the soil structure. When there is a better soil structure, more of the water caused by heavy rain will be able to sink into the soil, this causes there to be less water on the fields, which on hills in the south of Limburg will also stream off the hill and over the soil surface. Given the challenges that appear in terms of nature, water and the environment, but also because of the much wanted transition from agriculture to ‘recyclable agriculture’ (See the vision ‘Agriculture, Nature and Food: Valuable and Connected’ of minister Carola Schouten, cabinets decision 7-9-2018) it is important that the HAS call attention to sustainable soil management in their teachings. Because of the financial support granted to the lectureship, all of the participants are favoring a broader sharing of knowledge in the field of sustainable soil management. From the lectureship, a knowledge centrum will be founded where knowledge will be bundled and will become available to farmers, company advisors, contractors, and the educational system. The lectureship will also provide the students with knowledge about proper soil management by providing field trials in demo companies. Of the € 150,000 that The Regional Water Authorities contributes to the lectureship, € 50,000 is intended to be used for providing field trials with the aim of improving the soil quality. In these trials, lecturers and students share the knowledge they have gained during the lectureship through internships and research projects at The Regional Water Authorities.